We explained the first principle in above article and explained the human factors in article “Vertical Transportation Design and Traffic Calculations – Part Three”. Table-1 shows the Density of persons in Person/ m2 in a corridor and its effect on design. Table-2 indicates empirically derived average Pedestrian speed values as guidance. The table shows the typical pedestrian horizontal speeds (in m/s) and pedestrian flows in persons per minute (persons/minute) for a free flow design density of 0.3 person/m2 and a full flow design density of 1.4 person/m2. The flows assume a corridor width of 1.0 m.
The width of corridor is not specific, but must be at least 900 mm and is assumed to be 1.0 m. Equation (1) allows for the flow rate to increase/decrease as the corridor width increases/decreases. This factor must be used with care, as small changes in corridor width will have little or no effect. Table-3 shows Minimum width for corridors to accommodate various types of traffic. A (3) meter wide corridor would allow most traffic types to be accommodated. * Wheeled vehicles require extra width in order to turn at junctions, especially if they are very long, e.g, hospital trolleys. Traffic can flow freely only along unrestricted routes. Corridors are rarely free of obstructions. For example, a row of seated persons will reduce the effective width of a corridor by 1.0 m. Table-4 indicates the effect of a number of obstructions. Table-4 shows Reductions in corridor width due to obstructions. In a hospital corridor it is necessary for two trolleys to pass each other. Each trolley is pushed by one porter and another person with a bag of equipment walks alongside. 1- What width should the corridor be? 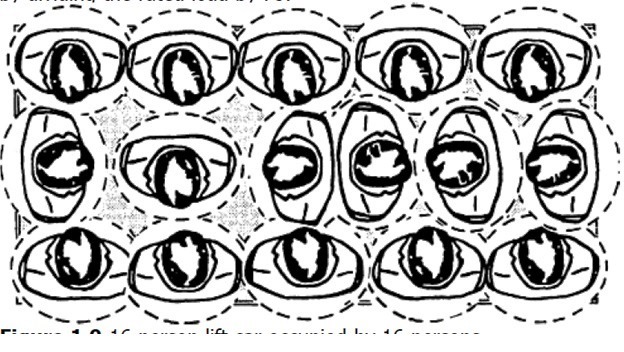 2- If a row of seated persons is encountered what effect would this have? 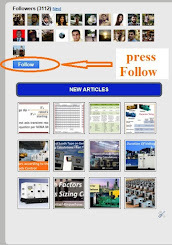 3-Indicate the probable flow rates at free flow design levels. For one way traffic; a trolley and porter occupies 1.0 m width, a man with a bag occupies 1.0 m width. If the traffic is two way, the minimum clear corridor width will need to be at least 4.0 m.
If a large obstruction, such as a row of seated persons, is encountered, the corridor width would need to be increased by as much as 1.0 m. so, the total width of the corridor will be 5.0 meters. Portals, which are called by various names (i.e. gate, door, entrance, turnstile etc), form a division between two areas for reasons of privacy, security, access control etc. They represent a special restriction in corridor width. Their main effect is to reduce pedestrian flow rates. Table-5 Portal handling capacities in persons per minute and persons per hour through an opening of 1m width. Most domestic doors are less than 1m wide (e.g. approximately 750 mm) and the flow rates would be likely to be the lower values in the range. Doors in non-domestic buildings may be slightly wider than 1.0 m and would permit the higher values in the range to be possible. 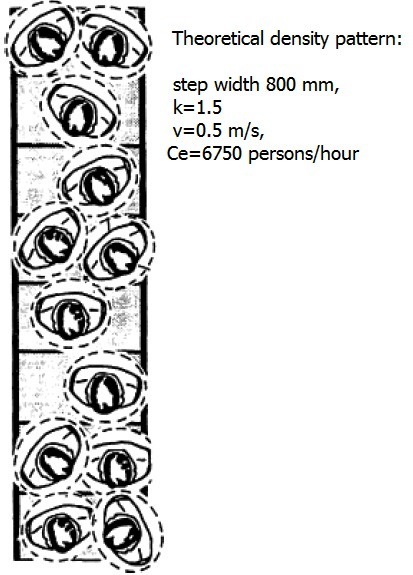 The differences between the movement on stairways and on flat floor are given in below table-6. The movement on stairways is more regular as disciplined by the stair steps. Depend on the pedestrian direction, age, gender and health status. A stair walker needs only to perceive two vacant treads ahead (and room for body sway) and occupies an area of some 0.7 m2. Full flow design is possible at a density of 2.0 person/m2. Human behavior: slowest stair walker, greater care in the down direction. A range of possible inclinations from 15° to 33°. W is the effective stair width (m). 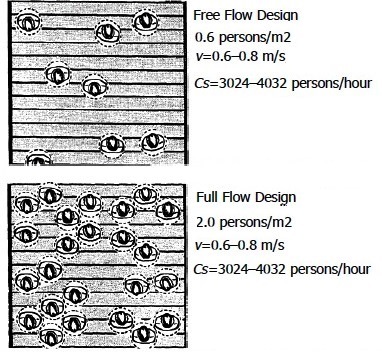 Table-7 shows Stairway pedestrian flows; possible pedestrian flow rates in persons per minute (person/min) and persons per hour (person/h), and typical pedestrian stairway speeds along the slope in meters per second (m/s) for a free flow design density of 0.6 person/m2 and a full flow design density of 2.0 person/m2 for each1m width of stairway. The hip widths, which are measured between the skirting panels are typically 200 mm wider than the step. These areas must encourage pedestrian confidence and assist the efficient and safe boarding of escalators. It is recommended that at least 1 1/3 flat step (light duty) to 2 1/3 flat steps (heavy duty) be provided for passengers when boarding/alighting an escalator. The average pedestrian boarding/alighting stride can be assumed to be 750 mm. s is number of escalator steps/m. On the London Underground it was observed, during peak periods, that passengers stood stationary on the right hand side of the 1000 mm escalator at a density of one passenger on every other step. The left hand side was occupied by a walking column of passengers at a density of one person every third step. Assuming the escalator was running at 0.75 m/s and the speed of the walking passengers was 0.65 m/s, what is the passenger theoretical and actual flow rate of the escalator? Noting that step depth is 400 mm. 1- From Table-9 for speed 0.75 m/s and 1000 mm escalator step width is 13500 persons/hour. And the effective (relative) speed of the passengers = 0.75+0.65 = 1.4 m/s. So, the total passenger flow rate = 3375 + 4200 = 7575 persons/hour.